Born in Dublin January 1973, Steve has been coaching in the Junior Club for the past 4 years. 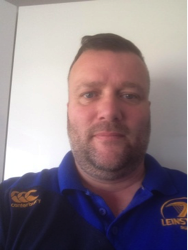 He is a forwards coach and his highlight for the club is winning the James O’Connor Cup last year with the Senior 4ths (Met.9). Steve played his rugby in Rathdrum, Greystones, and Gorey. He has Level 1 Coaching Qualification. Steve is married to Emma and has one little girl,Carla aged 2.